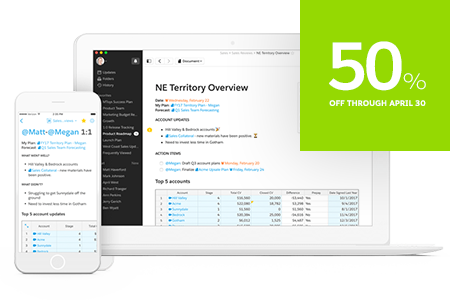 Get 50% off Quip until April 30. For details, complete the form and we'll be in touch. Or call 1-800-667-6389. Offer available only for existing U.S.-based Sales Cloud and Service Cloud customers with Performance edition and Lightning editions of Professional, Enterprise, and Unlimited. Offer ends 04/30/2017. Offer may not be combined with any other offer and is subject to change without further notice. Restrictions apply.